Two days after the fatal shooting of Officer Natalie Corona, the police department revealed that a letter reading, "The Davis Police Department has been hitting me with ultrasonic waves meant to keep dogs from barking," was found in the suspect's home. If reading in the ABC10 app, click here for multimedia. DAVIS, Calif. — The gunman suspected of shooting and killing Davis Police Officer Natalie Corona has been identified by the Yolo County Coroner as 48-year-old Kevin Douglas Limbaugh. The Davis resident died of a self-inflicted gunshot wound during a standoff with police on Jan. 10, hours after witnesses say he ambushed Officer Corona while she responded to a traffic collision. It is still unclear why the Davis resident began shooting last Thursday night. In a press conference Friday, Davis Police Chief Darren Pytel said it was unlikely that Officer Corona ever saw her shooter. Limbaugh had at least three previous encounters with law enforcement, including a misdemeanor charge last September, according to Paul Doroshov of the Davis Police Department. The September charges started as felony battery charges after Limbaugh, who worked at the Cache Creek Casino Resort, was accused of punching someone at work. “The death of Davis Police Officer Natalie Corona is an incredible, senseless tragedy. Our deepest sympathies go out to Officer Corona’s family, her fellow officers, and the entire Davis community. As indicated in court records, the suspect was an employee of Cache Creek Casino Resort who was involved in an altercation in September 2018. The incident was reported to the Sheriff’s Office and the suspect’s employment ended immediately thereafter. We cannot offer any further details on this personnel matter." The charges were brought down to a misdemeanor as part of an October plea agreement, on the condition that Limbaugh surrender all firearms to the Davis Police Department, Doroshov said. Limbaugh turned in an AR-15 to the department last November. 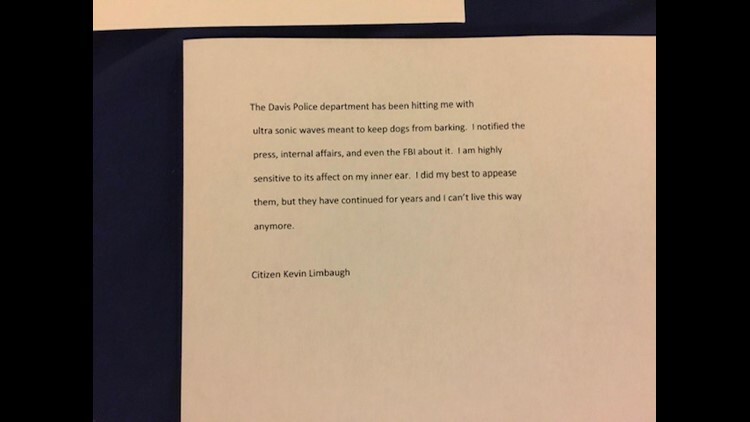 Prior to the above, Limbaugh had two other interactions with the Davis Police Department. In 2017 his ex-girlfriend reported him for harassment, telling police that he was texting her that she was worthless and told her to kill herself. The same year Limbaugh called Davis Police to report that his car had been stolen. Authorities have not determined where Limbaugh obtained the two semi-automatic handguns he was believed to have used in the Thursday night attack that killed 22-year-old Corona. Police said a gunman on a bicycle ambushed the officer, shooting her from the shadows as she investigated a car accident, then reloaded and narrowly avoided wounding others before walking home. Limbaugh left behind a backpack that helped police track him to the house where, after an hours long standoff, they found Limbaugh had shot himself. Two unregistered handguns were recovered in the house. "The Davis Police Department has been hitting me with ultra sonic waves meant to keep dogs from barking. I notified the press, internal affairs, and even the FBI about it. I am highly sensitive to its affect on my inner ear. I did my best to appease them, but they have continued for years and I can't live this way anymore." Shortly after the shooting death of Davis Police Officer Natalie Corona, this letter was the backpack of shooting suspect Kevin Douglas Limbaugh. Limbaugh died of a self-inflicted gunshot wound after a standoff with police at his residence. The shooting devastated the Davis Police Department, which has about 60 sworn officers and about 30 other employees. Corona was the first officer in the department to die in the line of duty since 1959. She had only been patrolling solo for about two weeks, the chief said. A candlelight vigil for the slain officer is scheduled for 6 p.m. on Saturday at Davis' Central Park. WATCH MORE: Father of fallen Officer Natalie Corona speaks out after her death. "I just want people to remember her," he said. "She didn't serve for very long, but she gave her life doing what she loved to do and we have to accept that."